What does Bat/Bat Mitzvah even mean? Mitzvah is often translated as “good deed,” but more literally, it means “commandment.” Judaism teaches that Mitzvot (the plural of mitzvah) are the actions that matter most to God. Many of these (like feeding the hungry or visiting the sick) are good deeds; others (like lighting Shabbat candles or fasting on Yom Kippur) are ritual acts that help us find spiritual grounding. 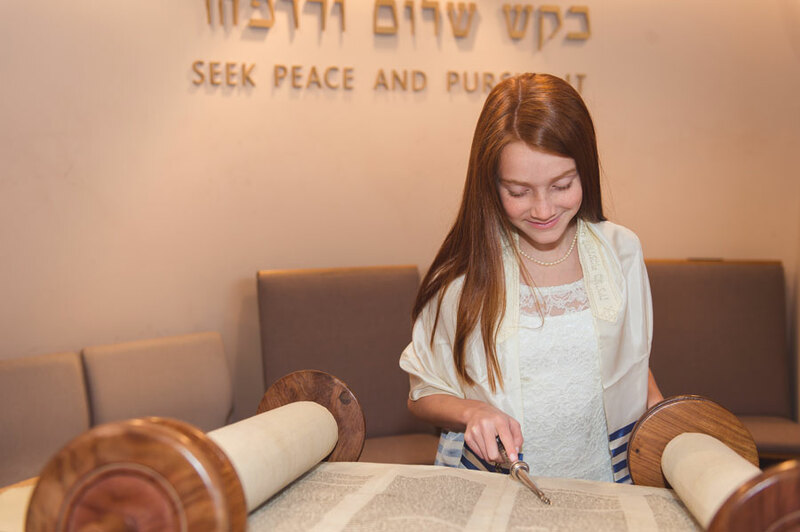 When paired together, the phrase “bar/bat mitzvah” means “one who is responsible for doing mitzvot.” At 13 years old, our tradition teaches, a young person is responsible for his or her own moral choices. We celebrate our children’s growing maturity, as they accept their place in and their responsibility to our Jewish community and our world. What is the history of this ritual? By the Middle Ages the attainment of majority gained new importance as an attainment of new religious rights (being called to Torah, wearing tefillin), and a special ceremony developed around this “bar mitzvah,” as a 13-year-old boy was beginning to be called. The custom of calling a boy up to the Torah was established as the way of recognizing entry into manhood. The bar mitzvah boy would chant the blessings, all or part of the Torah portion of the week, and/or the haftarah section from the prophetic books. The bar mitzvah boy would often give a scholarly address on the Torah portion or some section of the Talmud. This was followed by a feast, called s’udat mitzvah (“meal of celebrating the performance of a mitzvah”), to which family, friends, and sometimes the entire Jewish community would be invited. Ok, but what about our girls? What about now? Today, liberal Jews affirm the total equality of women in terms of religious privileges and responsibilities. In the 1800s, Reform Judaism abolished bar mitzvah in favor of confirmation for both boys and girls (bat mitzvah was not considered an option at that time). The first-known bat mitzvah in North America was that of Judith Kaplan, the daughter of Mordecai Kaplan, in 1921. Reform Judaism (which had by this time reintroduced bar mitzvah) and then Conservative congregations quickly adopted bat mitzvah, though in slightly different forms. In Reform, Conservative, and Reconstructionist synagogues today, girls, like boys, mark symbolic entry into Jewish adulthood through bat mitzvah at age 13. Depending on the congregation, boys and girls may conduct all or part of the service, deliver a sermon, and read or chant from the weekly Torah portion (and its blessings), as well as the haftarah (and its blessings).